It’s generally inadvisable to loose temper with a man of the cloth. The ramifications could go on for, well, a very long time. 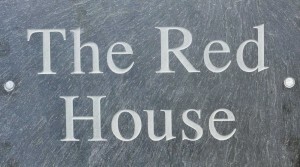 Of course I knew of the local vicar, the one who oversees much of community life around these parts with his easy-going, witty and frankly disarming demeanor, was only trying to be supportive; aiming to ameliorate some of the inevitable tension. But by stopping directly behind Asta and I at the very moment the judge at the Trevone Fun Dog Show was assessing my girl’s eyes for the prestigious Prettiest Eyes section, I’ll admit – I very nearly lost it. The night had not begun well. Kim and Asta got off to an abysmal start in the Best Pedigree section. There were so many entrants the judge sensibly elected to whittle them down to a final elite with Asta, and many other handsome specimens, ejected in the first round. Kim’s expression said it all. Kim doesn’t take failure lightly, making accusations of a fix on the basis that the judge, a professional dog groomer was inevitably going to choose those dogs he’d worked on. 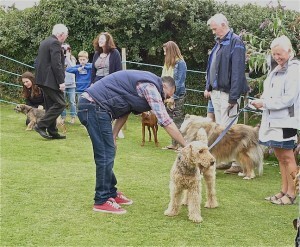 Inspecting Asta the judge had apparently said Airedale Terriers were often aggressive. I thought Kim was going to throw a punch. According to her the man next to her in the ring had said that he and the others were wasting their time as Asta was evidently a shoe-in. An opinion echoed by the ruddy faced woman on the plants stall who said Asta not winning was clearly a miscarriage of justice. The event was being held in the grounds of Well Parc, a family run hotel in one of the finest locations on the north coast. It faces due west with uninterrupted sunset views of the Atlantic with verdant cliffs spanning north and south to Padstow and Newquay. There are rumours that a certain celebrity chef wants to buy it and transform it into the jewel in what is already a pretty impressive catering crown. Which would be a shame as this part of Cornwall could do with a few more old fashioned, affordable, un-west London, un-groovified places for those who are happy enough with a pint and a packet of cheese and onion. Looking around at some of the tall, pelate thin, blonde holidaying mums with a lots of spelt bread inside them, their glossy cockapoos at the heels, anyone could see a change is coming. We were there because our friend Jane, novelist, aesthete, and motivator behind our Thursday night film club, was the dog show’s chief organiser. She’d pretty much insisted that Asta should enter, all the monies (£2 a category) going to local church charities. Fearing the worst ( Kim still smarting from Tashi Delek crashing out of a dog show in Camden some years earlier) we nevertheless decided to give it a go. In preparation Kim had stood Asta atop the kitchen table for much of the morning preening and grooming. However, after that humiliating first round there was talk of abandoning the event altogether and going to the pub. Of course it would have been churlish to to pull out so early on so we (ie Kim) decided that I should step into the ring with Asta for the Prettiest Eyes contest. Downing a large gin and water I began to remove my cravat fearing I might be overdressed for such a fleecy, shorts and Crocs event and thereby risk prejudicing the judge against Asta for a second time. Kim insisted the cravat remain. Competition was again very stiff. There were a great many entrants, maybe twenty. After all who doesn’t think their dog’s eyes are the prettiest? Indeed dog’s eyes are often thought to be the most endearing pooch feature of all. Ok, tails are popular too, and can tell a good deal about a dog’s character and temperament. Asta does in fact possess a very fine tail. 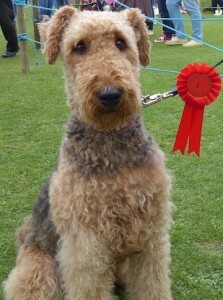 Rare among Airedale Terriers to be un-docked, long, curly and bushy with Pre-Raphaelite curls. The snag was that it doesn’t wag preternaturally, or of its own accord. She has a fine wagging tail when she chooses to wag it, but it doesn’t sashay back and forth 24/7 the way others attached to – I don’t mind saying it – less sophisticated dogs. Certain things set her’s off. One of them, said Kim, is me; my arrival at any situation. With this in mind the pair of us hatched a plan in which I would conceal myself behind the beer tent. Then upon Kim giving the Asta whistle (this is the tune of Pluto Shervington’s ‘Dat’ that some readers may know was a reggae hit in the 1970s) I would burst on to the scene and Asta would react by wagging furiously. However, the sheer number of people and dogs meant we couldn’t guarantee Asta would see me in time. The plan was too risky. It had to be the “Prettiest Eyes’, with the cravat. The ring filled up with a range of breeds. An American Eskimo, Collies old and new, a Dachshund (bearing a rosette from an earlier round), a Spitz, Schnauzer, a Pomeranian, a young white Whippet, a lovely old brown Labrador next to us and a mixed assortment of also rans. Most were pulling their owners hither and thither. Dogs sniffing each others’ behinds and owners trying to stop them. To counter the ‘aggressive’ charge I knelt down beside Asta. She responded perfectly by sitting down next to me. I wanted her looking straight ahead so that the judge could see directly into those soulful brown pools of canine innocence. The young girl with the chubby chocolate brown Lab next to us knelt down too. As the judge made his rounds, from our left to right, the silver haired vicar, speaking whimsical words of encouragement and support through across the Tannoy, moved around behind us. He stopped to say something about Asta the very second the adjudicator was attempting to look into her eyes. Asta span around to see what was going on behind her, eyeballing the vicar and pointing her arse at the judge. I tried, gently, to turn her the other way to no avail. The damage was done. “You’re a hindrance,” I barked at the vicar, regretting it as soon as I’d said it. He smiled and moved on. Asta turned back to face the judge who had also moved on. It was turning into a re-run of Camden; bearded youths with heavy metal t-shirts were winning bottles of Jack Daniels; dogs the size of pasties were winning bags of treats; and Asta was going home empty handed. All that remained was for the judge, who I don’t think stopped smiling for the entire duration of the show, grabbed a handful of rosettes, in all colours, and gave one last look at all the ‘Prettiest Eyes’ entrants. Perhaps to reassure himself he’d made the right decision. “You,” he said giving Asta a toothy grin and handing me the red rosette for first prize. “Because she does have the prettiest eyes,” said the little girl to our left who didn’t seem to mind at all that the judge hadn’t given her lumbering chocolate Lab a second glance. Kim was delighted. Jane, perhaps unsurprisingly for someone who’d recently leant me both Rupert Everett biographies, said the judge had been looking into my eyes and not Asta’s. And the woman at the plant stall was so delighted with the result she threw her arms around Kim. Asta stuck her head so far inside the treats bag it stayed on as a hat. And I think the vicar forgave my outburst because as we turned to leave he smiled and said Asta was lovely.